I just found this old photo I took of a large sign at the base of the mountain atop which Castle Poenari is situated. 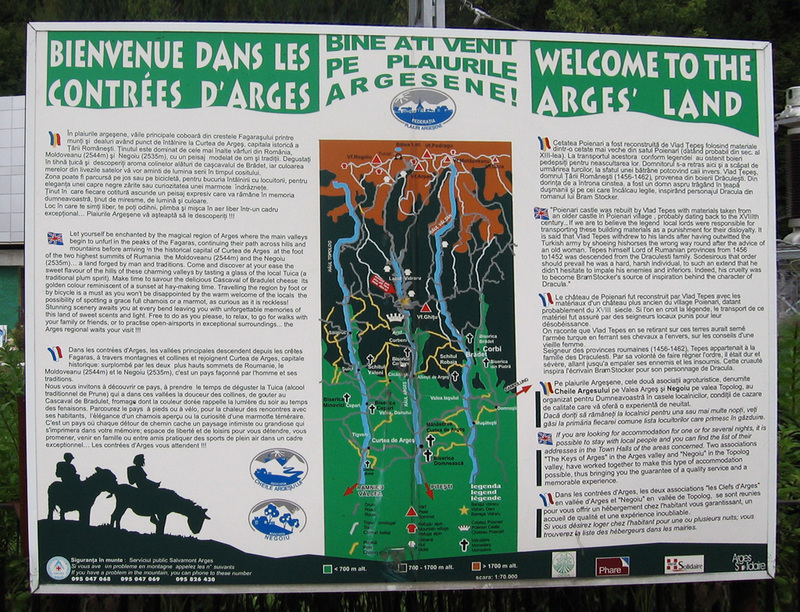 I’ve zoomed in and cropped out the English language portions, and also the map of the region, which may be useful if you’re planning to visit the area. Please see my articles about my visit to Castle Poenari, as well as my article about getting to Poenari. Here are just the English bits, which I’ve cropped out and edited together. Fascinating! Here’s a closeup of the map of the area. 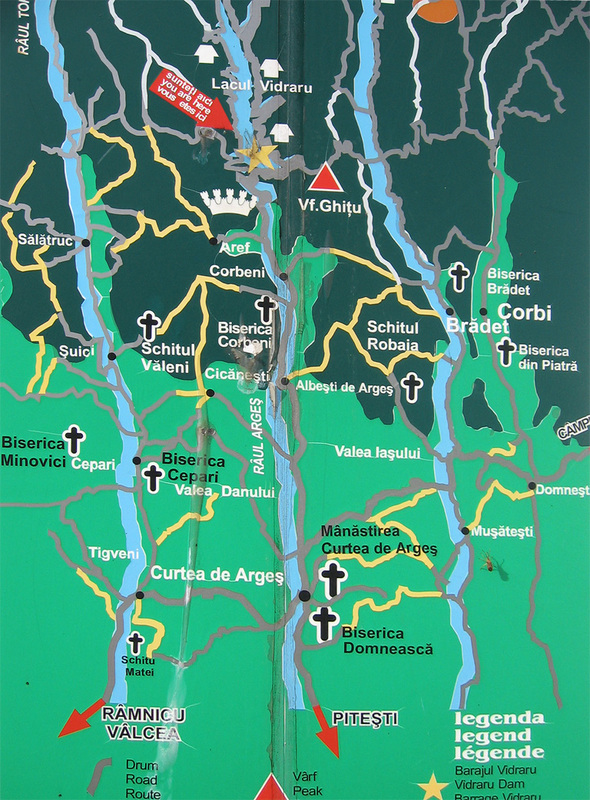 The red arrow at the top indicates where Castle Poenari is. I’d stayed the previous night in the town of Curtea de Argeș, toward the bottom of this map; the black dot to the right of where it says Curtea de Argeș is where the town actually is. You can see they’ve marked where the monastery (mănăstirea) is at the northern edge of Curtea de Argeș. If you’re in this area, the monastery and accompanying church are absolutely worth visiting! Pictures of those coming soon. So, back to Poenari. The minibus dropped me off near Arefu (labeled “Aref” on this map; not sure why). I was dropped off at the place where the gray road branches to the left. On this map dark green indicates mountains and light green indicates lower lands; mostly farms and towns. So as I rode the bus north from Curtea de Argeș I could see this huge mountain range in front of us. From the point where the bus dropped me off I could see the mountains up ahead, so I just walked north along that same road and pretty soon I could see the castle up on the mountain in the distance. I had been a little worried that it would be possible to miss the castle up on the mountain or the beginning of the stairs at the bottom, but fortunately they are not possible to miss. As soon as I saw the castle, I zoomed in as best my crappy little camera could and took the first picture on this page about my trip. Please note: there is a giant insect near Mușătești.